Laser system integration typically involves programming software-controlled laser equipment with beam delivery optics and a motion control device (such as a rotation and/or an X-Y stage) to perform the exact operation required for your application. This could be a system with an advanced integrated XYZ motion device for a step-and-repeat process, or coordinated rotary motion for seamlessly welding around a circumference. 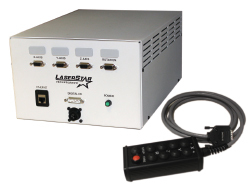 LaserStar Technologies extensive line of motion control and positioning systems, permit us to provide tailor-made systems for our customers while utilizing the most accurate and high performance motion control and positioning components available. Program the system controller with G-Code logic. Manage up to 4 Axis’ - PID compensation with velocity and acceleration feed forward, synchronizing motion, point-to-point positioning, jogging, linear and circular interpolation, contouring. Ethernet 10 Base- T Port; (1) RS232 Port; 8 TTL Inputs and 8 Outputs.